With the headlight assemblies taken care of I’m continuing my focus on getting the engine bay cleared out. So, for this update I decided to focus my attention on getting the power brake booster and master cylinder removed. 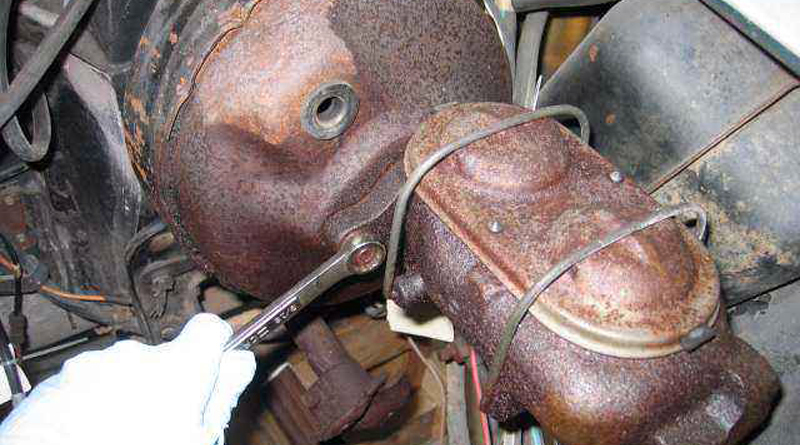 Here’s a photo of the leaking master cylinder and power brake booster – they certainly need some attention. The first step in removing the power brake booster was to remove the two nuts securing the master cylinder. The brake lines that connect to the master cylinder would ordinarily need to be removed as well, however in this case they were disconnected long ago when the body was lifted from the chassis. With the two nuts removed the master cylinder is easily removed by simply sliding it off the mounting studs. I’ve purchased a new master cylinder to replace the original so I won’t be doing any work on this master cylinder. Unfortunately, removal of the power brake booster is not as easy. Although it is connected to the firewall with only four studs and nuts, the nuts are located high on the firewall behind the gauge cluster and above the brake, clutch and gas pedals. In order to gain access to these nuts the drivers seat needed to be removed along with a ventilation duct and a position switch for the brake pedal. With those components removed I used several long sockets and universal joints to remove the four nuts. All told removing these four nuts took about two hours. Although removing the nuts was not overly difficult, it certainly required a fair bit of patience. With the nuts removed from the studs the power brake booster can simply be pulled away from the firewall. Below is a photo of the complete power brake booster. To the left you can see the hydraulic pushrod and vacuum seal which came out of the booster on their own when it was inverted. With the power brake booster out of the car I started disassembly. My ultimate goal is to check to ensure the internals are in good working order and to clean up it’s appearance. 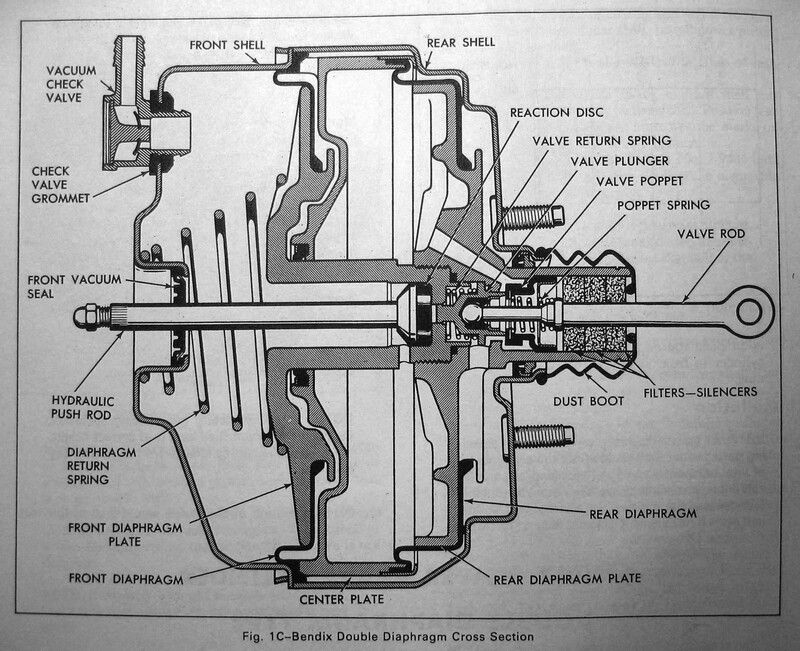 For reference I’ve included two schematics of the power brake booster that are included in the 1971 Chassis overhaul manual. To see full size images, click on each image. To start I removed the clevis and dust boot from the valve rod. With the clevis and dust boot out of the way I took to the booster housing with a wire wheel to remove the worst of the dirt, grease, rust and scale from the housing. After cleaning the housing the filter retainer was removed by gently prying on it with a screwdriver. 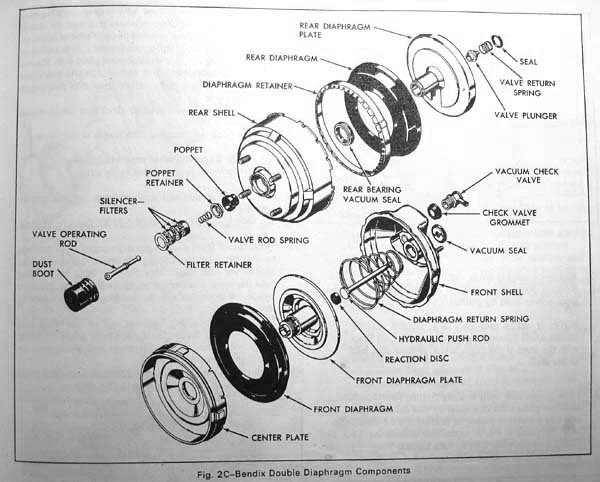 The silencer filter located below the filter retainer was also removed at this point. 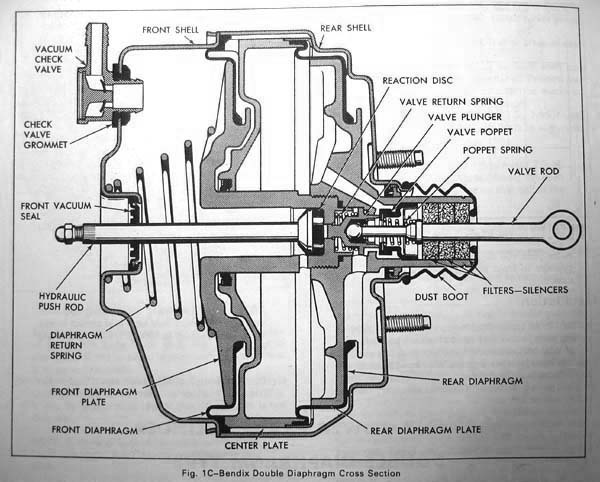 Next the valve rod was removed by mounting the brake booster in a vice, reinstalling the clevis on the valve rod and, using a 3″ block of wood, prying upward on the rod with a large wrench. Removing the valve rod takes a considerable force so be sure to use a piece of blocking that will prevent the booster housing from being dented. With the valve rod removed the valve rod spring, poppet retainer and poppet were also removed from the housing. Below you can see each of the components that were removed. To the left of the photo is the poppet, to the right are the silencer filter and filter retainer. Near the bottom are the valve rod and clevis. The next step in disassembling the power brake booster is separating the two halves of the booster housing. The two halves are held together with a large compressive force which is induced by a spring contained within the booster housing. For this reason separating the two halves requires a specialty tool. Rather than buying this tool, I’m planning to fabricate one during the upcoming weekend, but first I need to figure out what to make… Come back soon to see what I come up with and to see the complete disassembly of the power brake booster!